Mumbai: Six months of continued inflows into equity funds and a change in the investment strategy at Life Insurance Corp. of India (LIC) has led to the country’s 44-firms strong mutual fund industry overtaking the state-run insurer as a bigger owner of local stocks for the first time. At the end of September, the value of mutual fund equity portfolio in listed firms stood ₹ 4.94 lakh crore compared to ₹ 4.75 lakh crore held by LIC, data collated by Prime Database shows. This is a clear positive for equity markets, said Dhirendra Kumar, founder and chief executive, Value Research Ltd, a New-Delhi based mutual fund analytics firms. “Broad based institutional play improves the market’s efficiency to a great extent," he said. 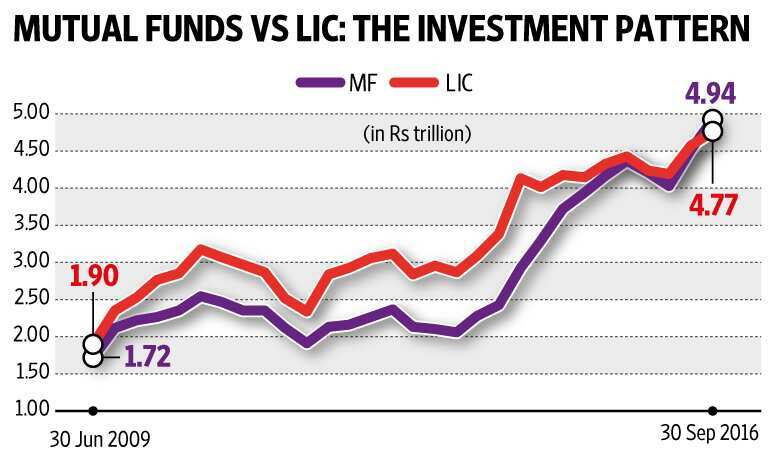 Mutual fund holdings were spread across 1,088 companies while LIC has invested in 310 firms. A caveat to this analysis is that only those firms where these institutional investors hold at least 1% have been considered. “Since mutual funds are required to follow regulatory disclosures for every investment and the fund managers are subjected to greater probity by investors, the increase in mutual funds’ equity participation in such a scenario is a strongly positive development," said Kumar. “Additionally, since the equity inflows are steadily growing rather than abruptly jumping, it means the money coming to the fund industry is a sustainable asset." As the Sensex gained 10% in the first half of this fiscal year, investors poured money into mutual fund schemes. Amfi data shows fund houses got net inflows of ₹ 19,829 crore in pure equity schemes, ₹ 11,828 crore in balanced schemes and ₹ 2,404 crore in equity-linked saving schemes between April and September. LIC is currently realigning its investments as a part of fresh strategies in the insurance market. The insurer is increasing its focus on pension and annuity business, which calls for higher fixed-income investments. Annuity requires a matching asset class which gives a steady income, i.e. fixed income. On 24 August, Mint had reported that (LIC) will invest around the same amount in equities this fiscal as it did last year, and increase its investments in debt instruments. The insurer had invested around ₹ 60,000 crore in equities last year. On total assets managed, however, mutual funds continue to lag LIC. 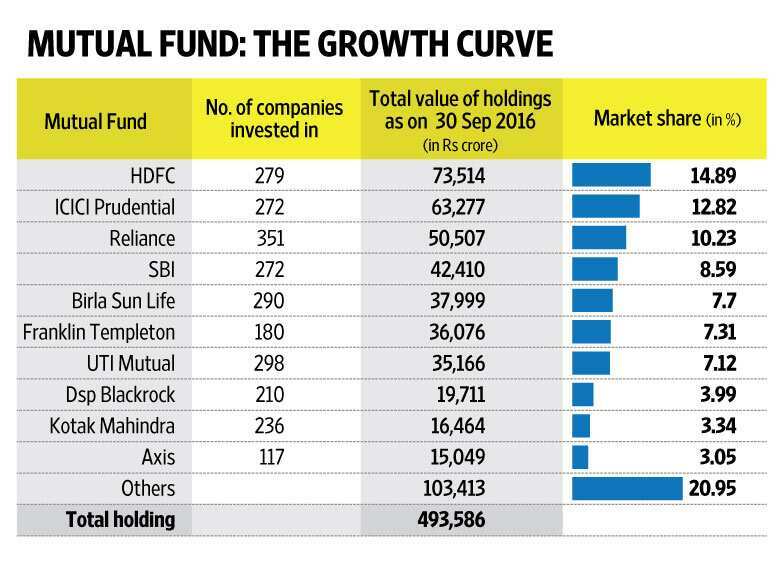 In the September quarter, the 44 mutual fund houses, managed an average ₹ 16.10 lakh crore of investor assets, data from the Association of Mutual Funds in India shows. In comparison, LIC, which manages insurance contracts for at least 250 million people, had total assets worth ₹ 21 lakh crore. According to Pranav Haldea, managing director of Prime Database, during the September quarter, the holding of mutual funds went up in at 338 companies and came down in 322 companies listed on NSE. Between July and September, LIC increased stake in at least 38 firms while trimming stake in at least 71 firms listed.